1/6/2019: Massanutten Western Slope Trails are again open for daily use! Trails will close again on November 1, 2019. Remember you need a trail pass! Online resources for mapping can be found here: MTBproject and Open Cycle Maps. The Massanutten Western Slope is private property, you MUST have a Massanutten Trail Pass to access it. 100% of all fund from trail passes go to the SVBC This system only benefits your local Bicycle Coalition. To obtain a trail pass, please read the following very carefully. Don’t hesitate to contact us with questions after you read ALL the directions. You must be a current SVBC member. You can join us online here. Not sure if your membership is current? Check NOW. ** You don’t have to complete trail work prior to getting your pass unless you have failed to complete the prior year’s trail work. Any vehicle parked in the Western Slope parking lot must display a current Western Slope Parking Pass. We will MAIL you a trail pass as soon as you complete all of the above steps. The pass will be mailed to the address you specified on your Risk and Release Waiver. I bought the pass. How do I get the map? I need to know if I completed everything to receive my pass.. I wanted to volunteer time to acquire it, but I don’t have a clue if it went through. Alec- Generally the passes takes about a week to receive in the mail. Your pass is on the way. Are you all open now or still closes during the week? Jason, the trails are again open every day. Go out and enjoy if you have a trail pass! I just joined, signed the waiver and donated $50. Can I use the trails immediately or do I need to wait a week for my pass to come? Is there something I can print out temporarily. You can print out your waiver as your temporary trail pass and place it in your dashboard. Need a trail pass for tomorrow? Every time I try the EventBrite link, it says sales ended. Sorry about that. Everything should be back up and ready to roll now! I got a day pass was I suppose to get a parking pass as well? The rearview mirror hangtag “parking passes” are only for the annual pass holders. Either your day pass or day pass waiver can serve as your parking pass while on the Western Slope. 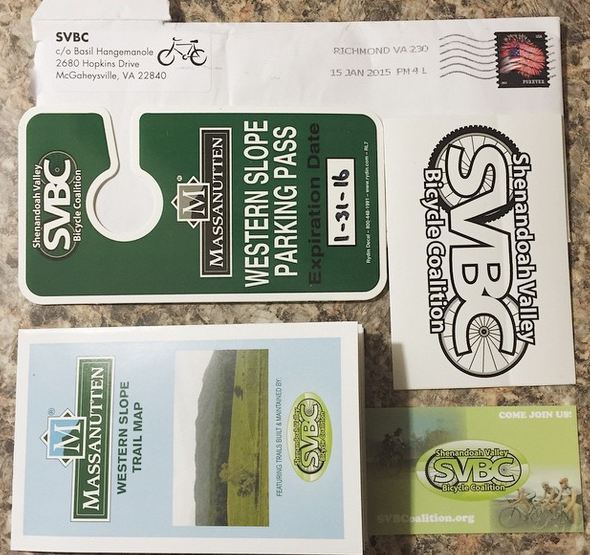 Does each member of the family need a trail pass, or is there a Family Trail Pass/as there is a Family SVBC Membership? Great question Meg and sorry it isn’t clearer on the page. Each adult needs a trail pass. Children who are old enough to participate in volunteer trail work also need a trail pass. Are there any local bike shops or general stores that sell the trail pass? I am trying to purchase a day pass for today, but when I select today’s date it says ‘Sales Ended’. Is there some way you can purchase a pass for same day riding? Tim, the system has a glitch that we are working to remedy. Please purchase for a later date and feel free to use it for today. Sorry for the hassle.